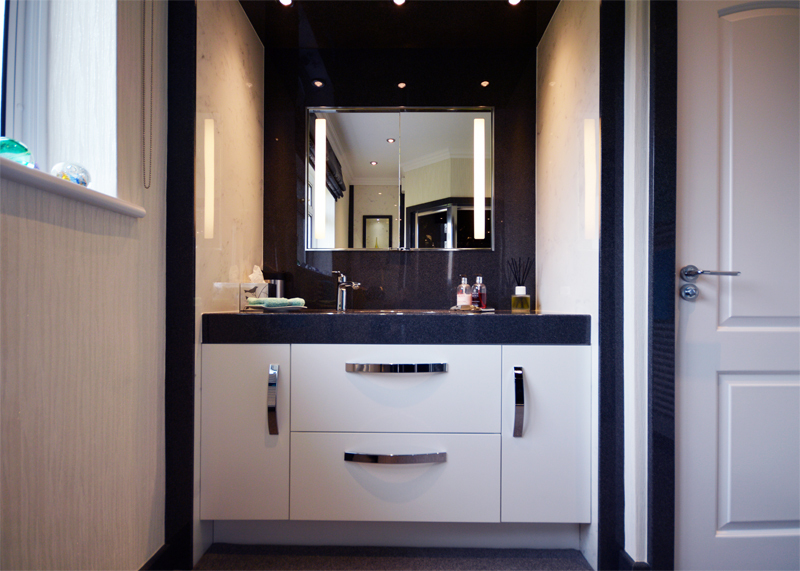 This recently completed bathroom design in Sharples, Bolton, is a classic combination of black and white marble finishes for a timeless appeal. 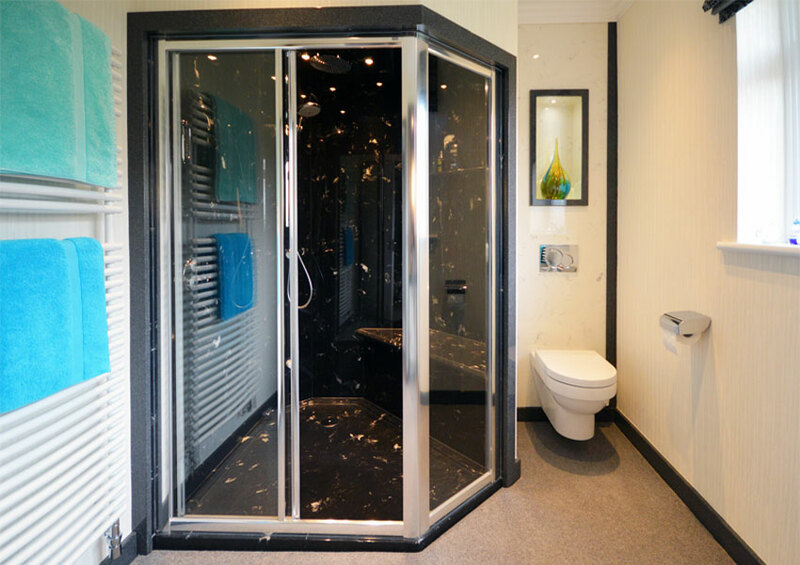 A bespoke shower tray from Versital is used to create this large fully enclosed shower cabinet. The shower is fully surrounded in matching black marble style panels, also from Versital. Versital is a high quality hand made cultured marble, meaning that it is 100% waterproof and stain resistant. Even better – there is no grouting in this shower so extremely easy to keep clean. Being fully enclosed, the shower also doubles as a steam cabinet with a steam generator built in, along with a custom seat for a real luxurious experience. Custom built bathroom cabinet by Langley Interiors in a hand painted white finish. Including lots of storage, with two cupboards and two large pull our drawers. Fully fitted and scribed into the recess. Designer chrome handles complete the look. 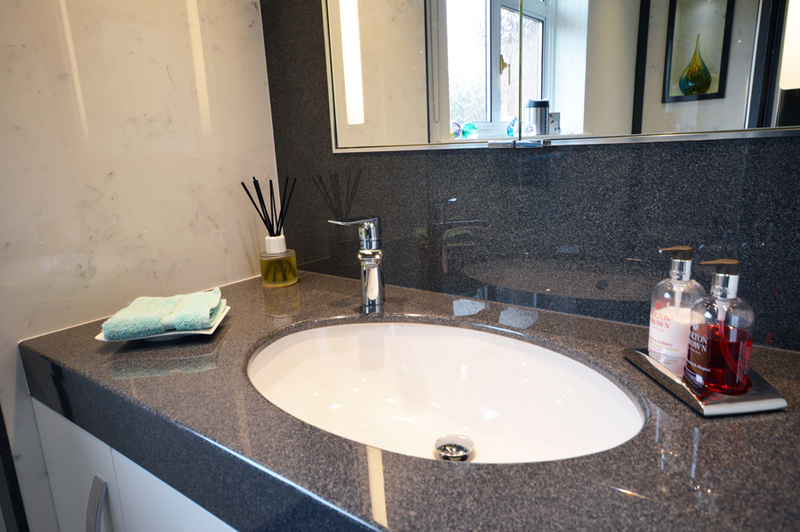 The vanity top also from Versital is a beautifully complementary granite finish in ‘Dusk’. Unlike real granite, the top is non porous and won’t stain. We approached Langley Interiors having dealt with them 20 years previously when they fitted three bedrooms, knowing that they had extended their portfolio to include bathrooms. Peter Langley took us through the process from initial design, drawing approval, choosing materials to installation. His proposals were developed from our original brief which he challenged to ensure that we got what would fully satisfy our needs. The quality and application was such that we engaged them to carry out the refurbishment of the rest of the house and are absolutely delighted with the outcome. Peter Langley and his team have done a terrific job. They started each element on the agreed dates, met the programme and kept to budget. Additional work was highlighted and agreed. My wife and I would recommend Peter Langley and Langley Interiors without reservation. If you would like to visit our bathroom design showroom, or would like an appointment with our senior designer Peter Langley please call us on 01204 525432. Our showroom is open Monday to Friday 9am – 5pm, and Saturdays are available by appointment. Make an appointment.